It is so easy for a child to die in a bathtub, in just a minute or two. The reason is because children -- especially babies -- are unstable. When they slip underwater, they die silently. It only takes a minute. NEVER leave a baby or small child in the tub alone, not even to step out and step right back in. A bath seat or ring does not make any difference. According to the CPSC, "Always keep baby in arm's reach." NEVER leave the water running to avoid the risk of scalds. NEVER leave water in the tub. A child can tip in and drown. See also buckets. 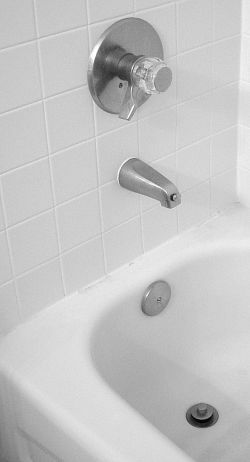 Put a soft protector over the faucet to avoid head injuries. With babies, also pay particular attention to water temperature. Water should be lukewarm, not hot. It is very easy to scald or overheat a baby.